Oral history and video history outreach. We conducted almost 50 hours of interviews with NACHA employees, retirees, members, and other ACH innovators nationwide. Since NACHA is a membership association as well as a rule-making body, this material fed into every aspect of the campaign. Messaging. We worked with NACHA’s in-house marketers to develop themes and talking points for use by executives in presentations and speeches throughout the anniversary year. Anniversary video. “NACHA at 40: Celebrating the Past | Defining the Future” draws on CorporateHistory.net’s oral history program and video history interviews. It appears in the NACHA history timeline and on the NACHA Videos YouTube channel. Factoids. Our research turned up nuggets of information and quotable quotes used in a calendar given to 2,500 attendees at the annual PAYMENTS Conference. 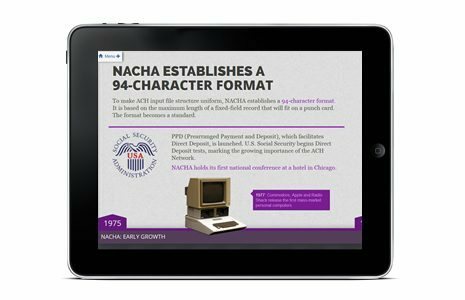 A single screen from the three-level web timeline showcasing the history of NACHA, the ACH Network, and major technology milestones. The timeline includes historic video clips, radio spots, and pop-up profiles of ACH innovators.